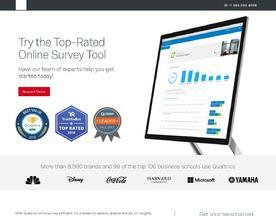 Online Survey Software provides a platform for companies and individuals to set up online surveys relating to a specific topic of their industry or research. In the case of a company, this could be research into a new product or how to make an existing product better. For others, this may be research for university work or simply just for fun! The Survey Software here is offered under the SaaS (Software as a Service) model, meaning that the software is web based, hosted on the Cloud and can be accessed when needed through a client or web browser. If you’re looking for similar online software like Survey Software, consider our Feedback Management and CRM software categories.